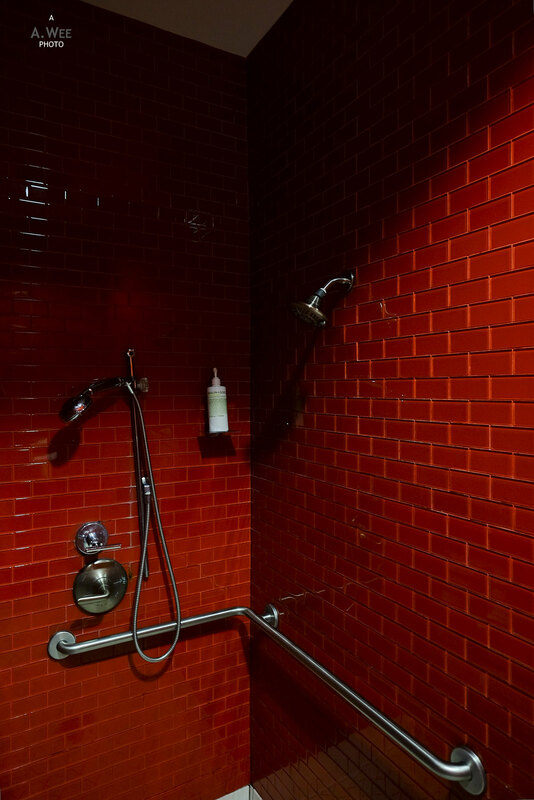 After my last flight, I head to the Sky Club to check out the shower room, only to find their showers are in a terrible state. Not only was there a lack of shower gel and a broken shower head, water temperature was also dysfunctional and only hot water emanated out from the tap. 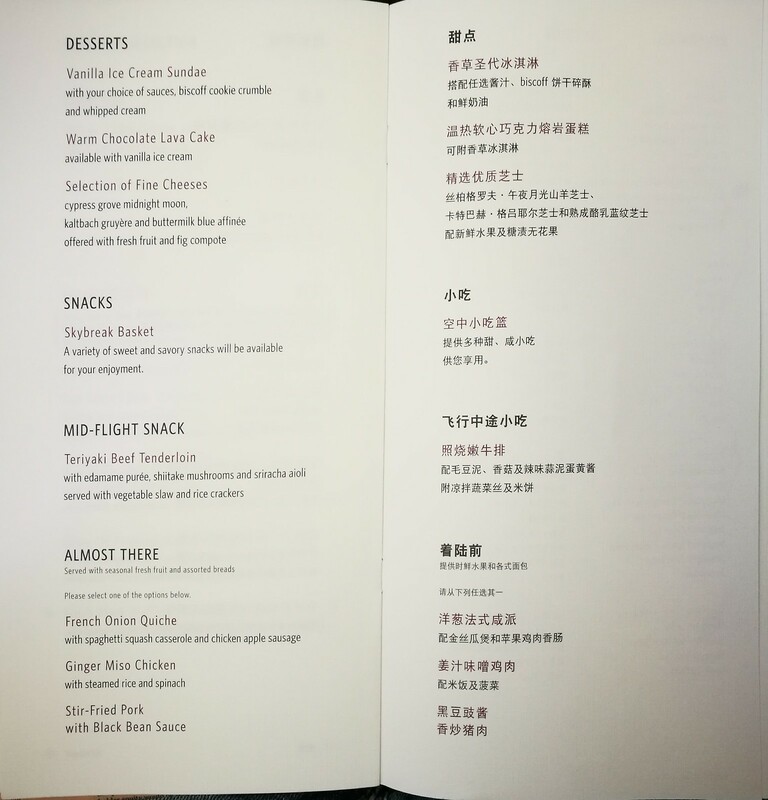 I did have a quick bite at the lounge since the breakfast service on the flight was a bit lacking. I would not make a review of the lounge though some photos the lounge are added here since I wrote about this lounge before. 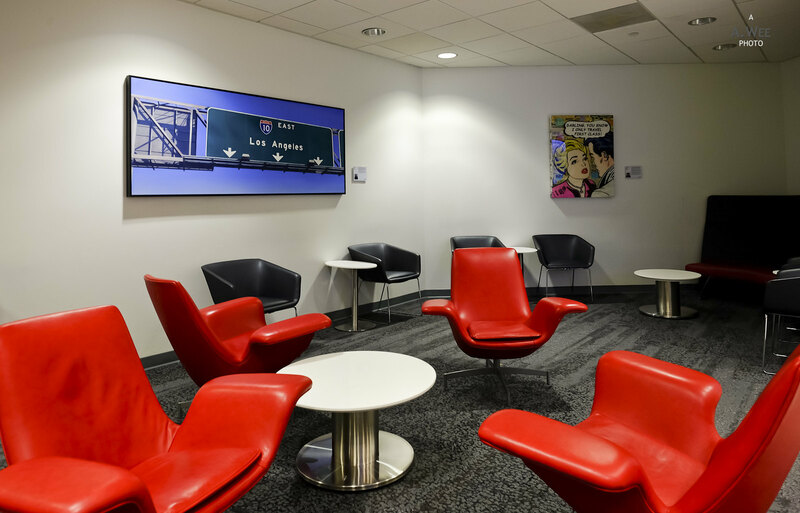 With Delta’s imminent move to Terminal 2 and 3 in Los Angeles, this lounge space will soon be vacated and that is probably the reason why not much has gone to maintain the lounge amenities. 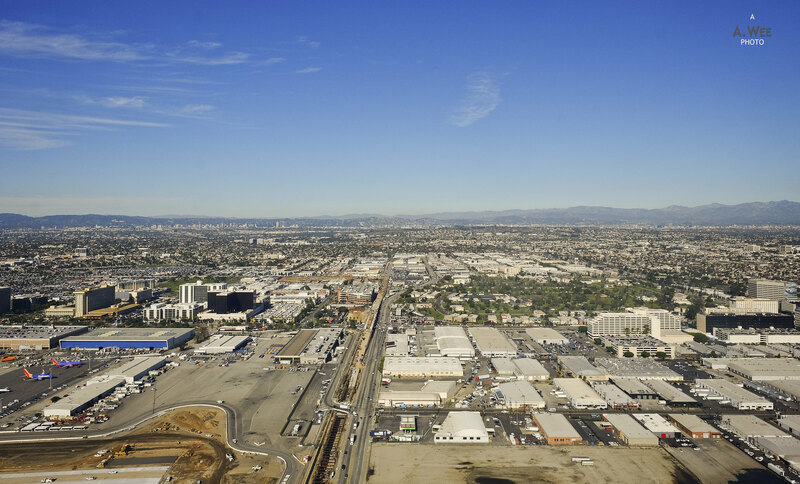 Remote Working Tip : Doesn’t matter whether youre in Los Angeles or Shanghai you can still catch up with your office work remotely with trending virtual desktops from CloudDesktopOnline.com with enterprise application Add-Ons such as hosted SharePoint, Exchange and Office 365 from www.Apps4Rent.com with impeccable tech-support. Since I had spent quite a bit of time in the Sky Club, I went to the gate hoping to catch a glimpse of the 777, but it was blocked and no photos of the plane before departing. With a crowded gate area and limited seating it was a bit uncomfortable and there was even a bit of a delay in boarding. Fortunately, the gate agents followed the Sky Priority boarding procedure and there was orderly boarding process. As I turned left towards my seat in the front cabin, there was already quite a bit of people onboard. 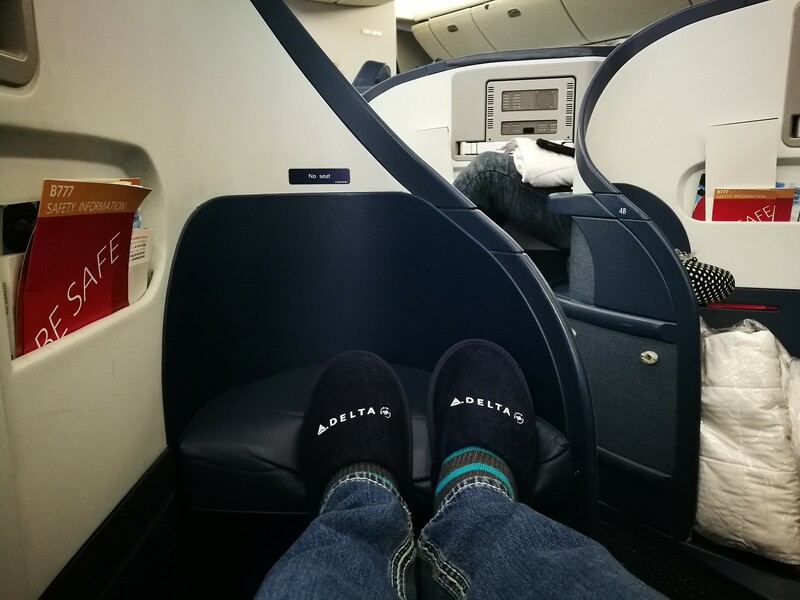 On the seat as usual was the full duvet and pillow set with slippers and noise-cancelling headphones. There was also a packet of sweet and spicy pecans. 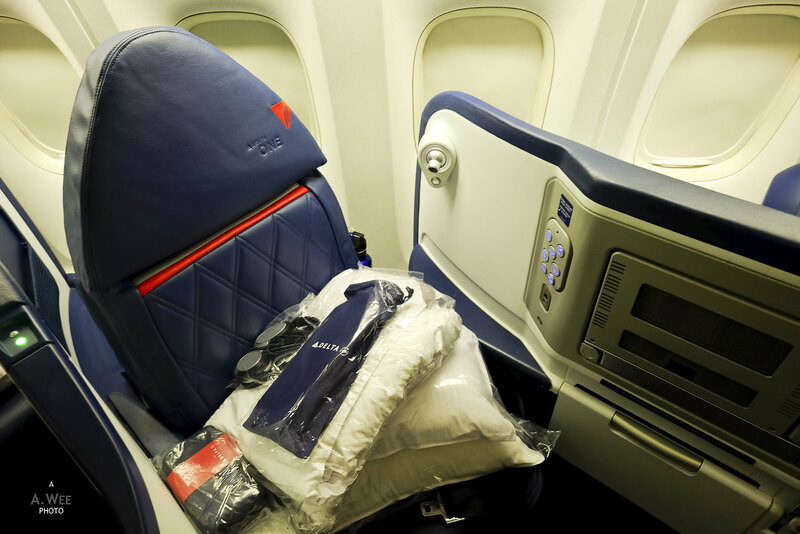 Delta ONE Business class onboard the 777 was configured differently and was in the old first generation herringbone seats that Cathay Pacific recently phased out. 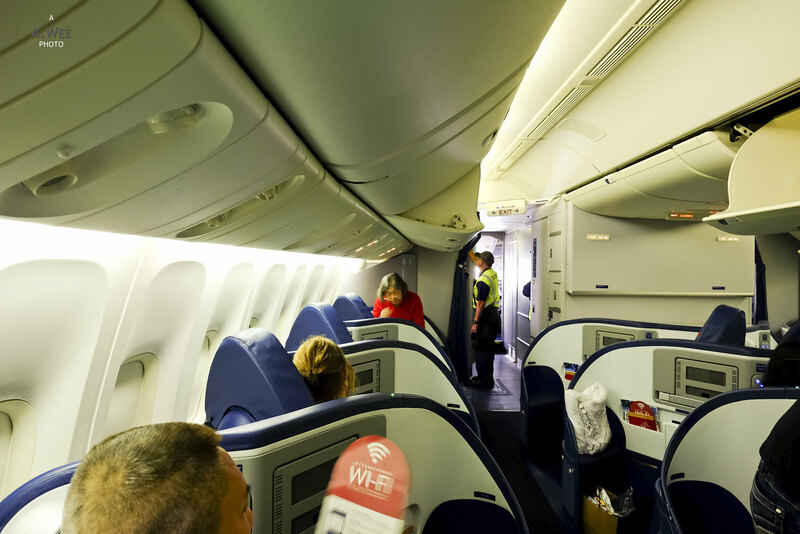 These seats do not provide the best views out of the window as passengers face towards the aisle. 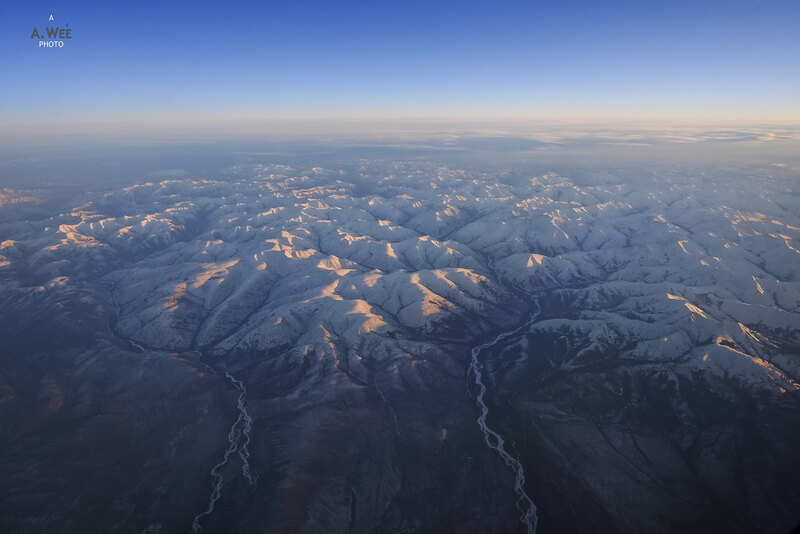 However they were slightly angled towards the window more than the Cathay’s version and it was still possible to see out and take photos on the window seat. 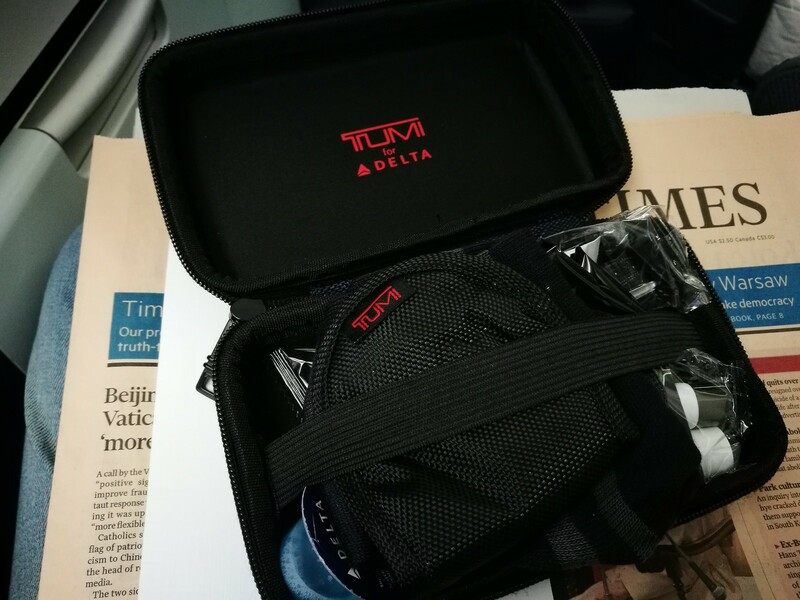 Amenity kit provided was still the Tumi hard case with contents by Kiehl’s. They have some of the best amenity kits out there with contents that was very useful for travelling and I even liked their hard case. 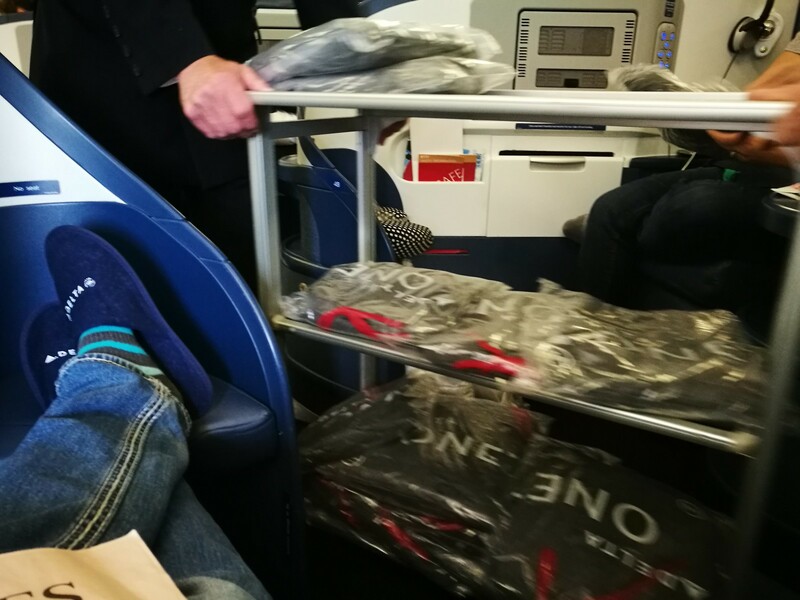 As I settled down, an Asian lady settled down across on the aisle while a Chinese family with a newborn baby was seated behind taking 3 seats amongst themselves. 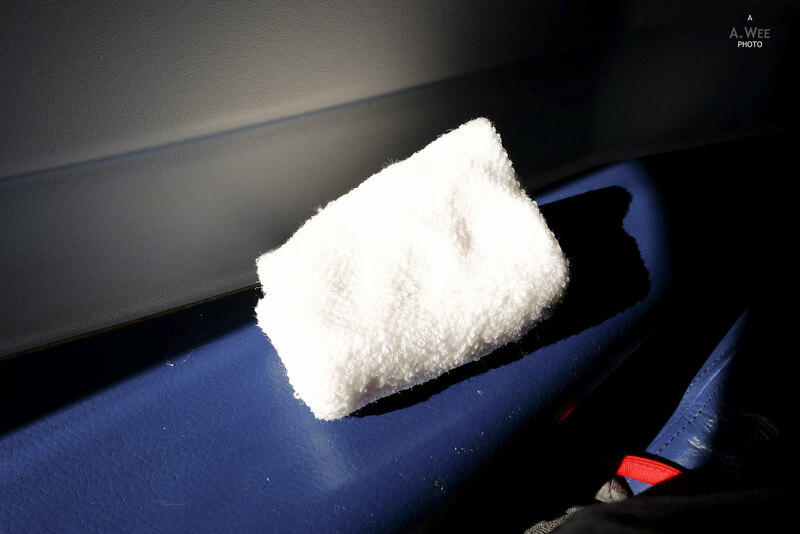 With that, I counted 2 families with newborn babies in the cabin today and the family behind me was fortunate in the extra empty seat that they were able to use to sleep the baby. Of course a few crew members did have to remind them the danger of leaving the baby on the seat themselves. Pyjamas were then offered after doors were closed by the male steward and this time around, I managed to get one in a medium size, which fits me well. 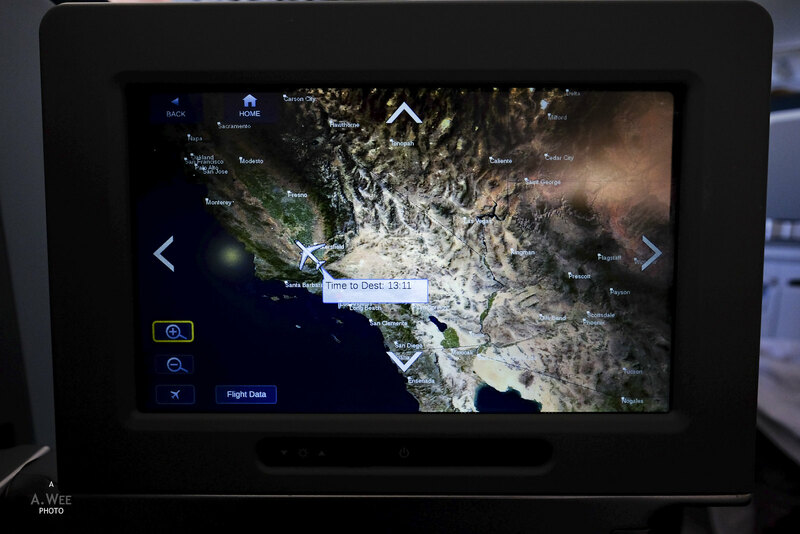 After boarding was completed, the captain came online with an estimated flight time of 13 hour and 35 minutes. China immigration forms were then handed out before pullback. 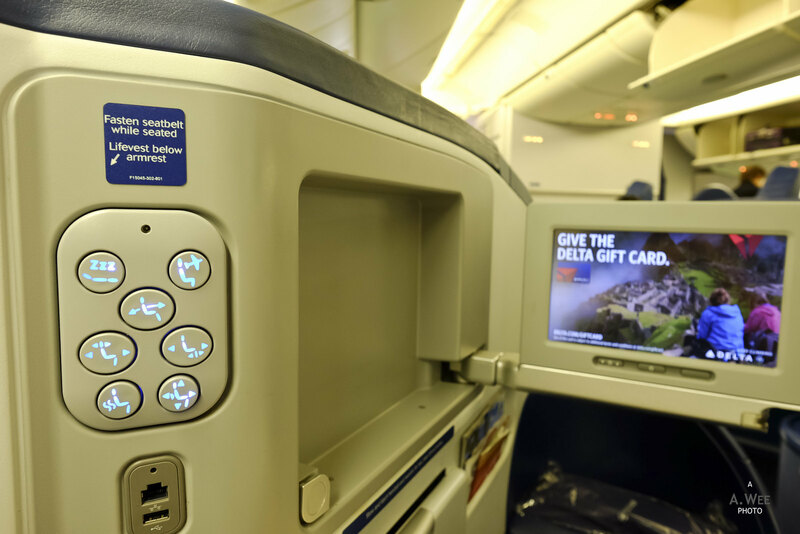 The herringbone seats meant the screen has to be swivelled out to view the safety video, and should have been stowed back before take-off but there was no such rule enforced during this flight. The quick take-off was quite unique as we faced east, instead of west towards the Pacific Ocean. 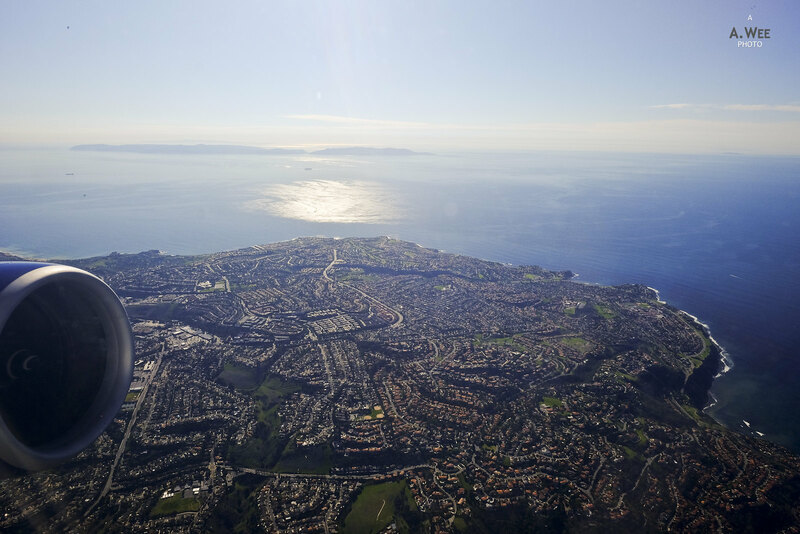 The plane turned south before heading north from Palos Verdes towards Malibu. It seems we would be doing a Polar route flight today. 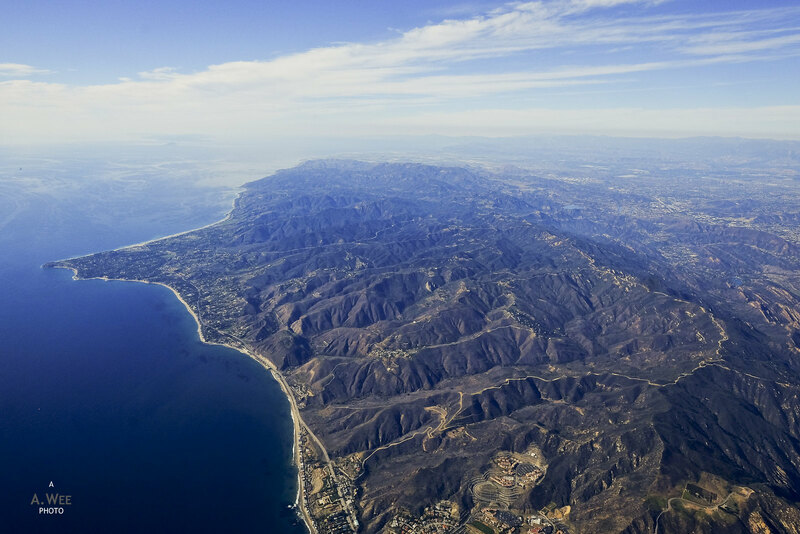 Cabin service started around half an hour into the flight with a hot towel as we passed by Bakersfield and the clear weather meant I had another scenic flight across the Santa Monica mountains. 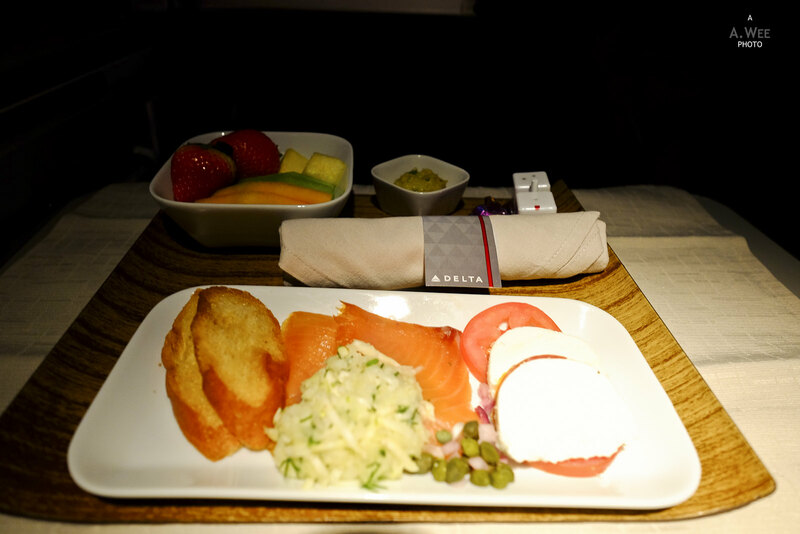 As I had picked the western meal selection, the appetizer was the smoked salmon. 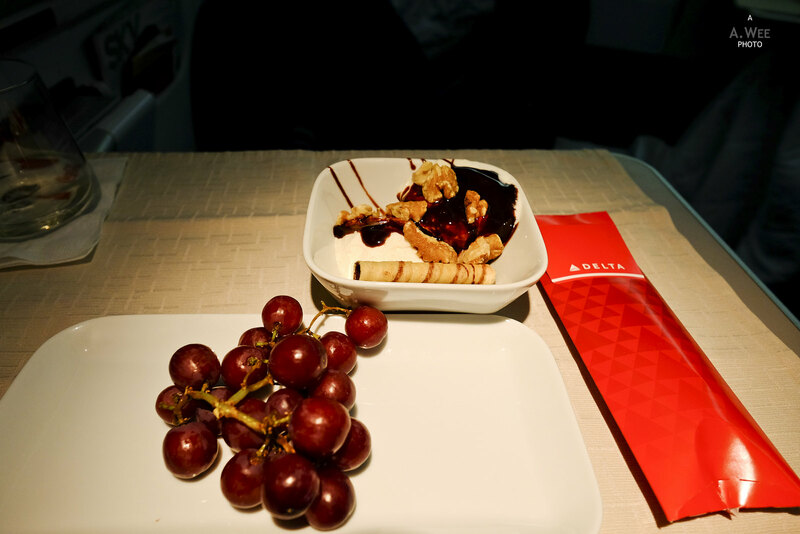 A usual appetizer in most flights whether in Business or Economy, they were average and nothing to shout about. Then came the salad and soup. 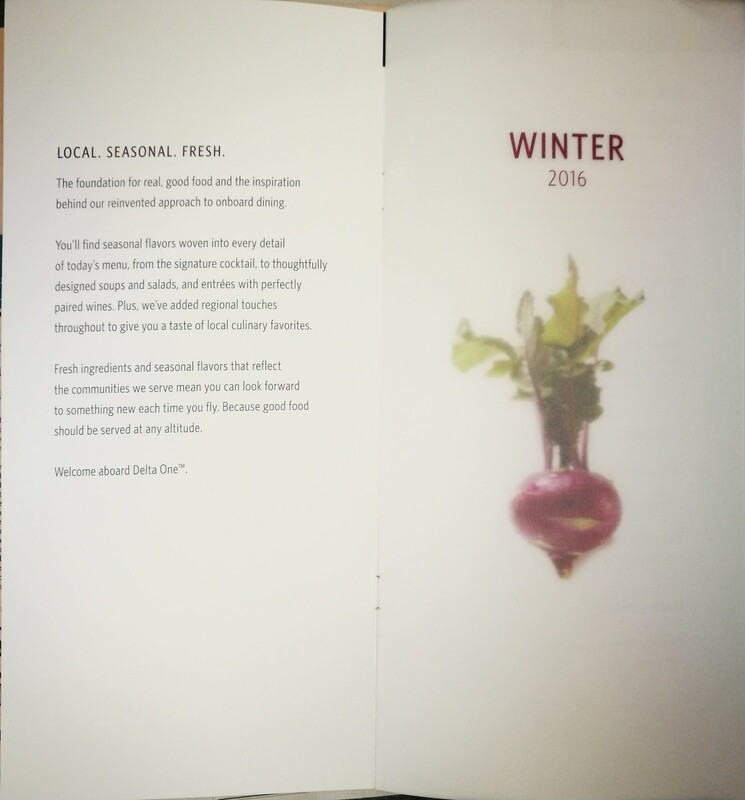 Considering their domestic flights usually have pretty good salads, I was disappointed in the bad presentation of the salad and it seems like a mess. Meanwhile what was supposed to be onion soup seems to have a lot of corns inside, and feels more like a chilli corn soup. 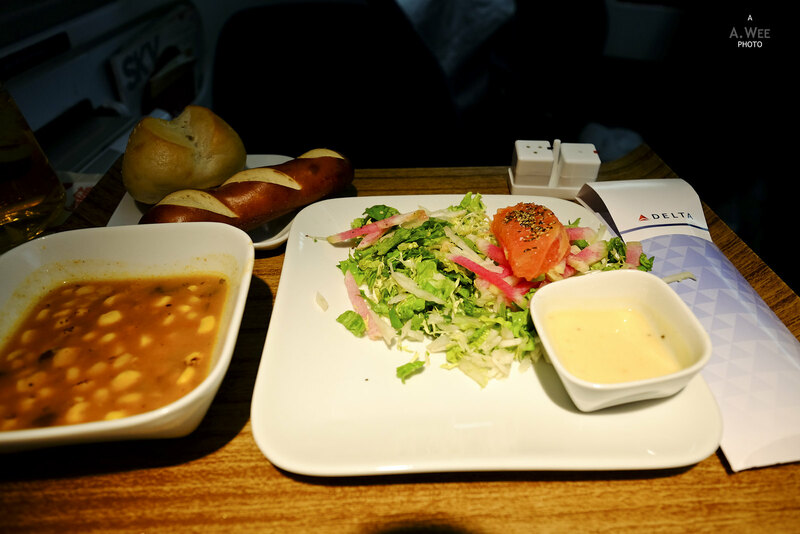 It was fortunately tasty and I do like corn soup. 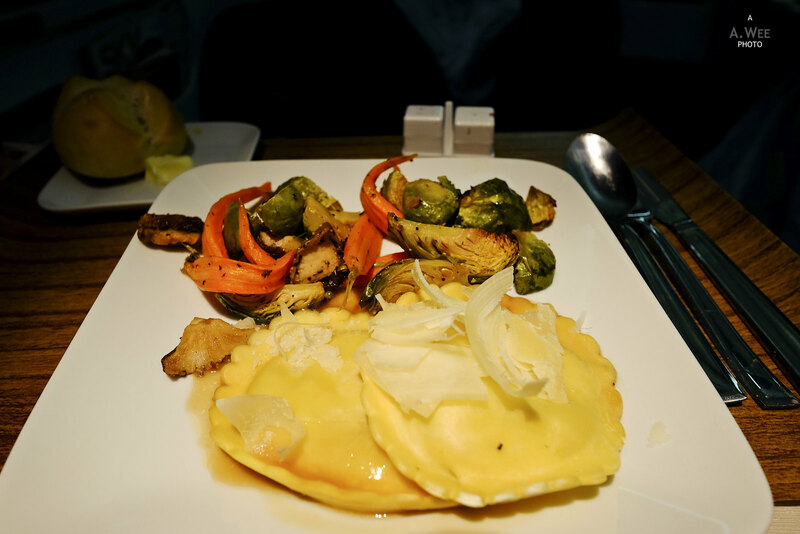 For the mains, I picked the ravioli as I liked anything with truffles and while it was not on par with what one might get, it was edible and did have hints of truffle flavour. The sweet grilled vegetables was also nice as the side dish. Dessert was non-existent except for the sundae as I had wanted the chocolate lava cake. Since I still had space in my tummy, I had the sundae and some grapes. 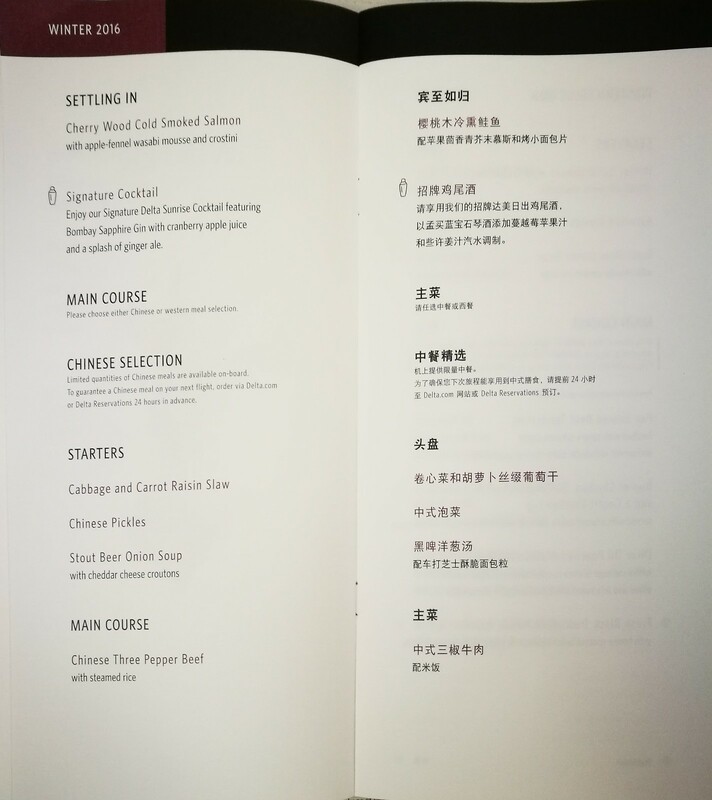 There was some missing items off dishes and some of the meals were quite underwhelming. Thus I found the catering to be a mess on this flight though I somehow suspect it was the fault of the catering company. 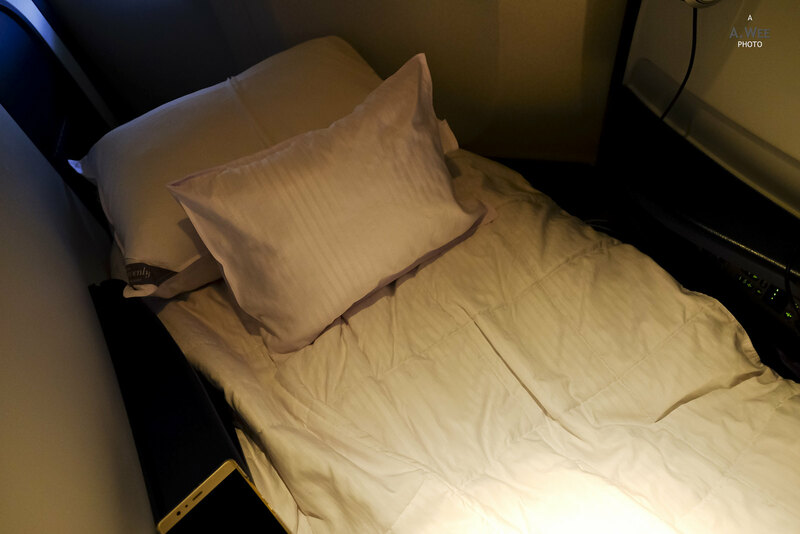 With the end of the relatively short meal service, I changed to the pyjamas and setup the seat to be a bed. 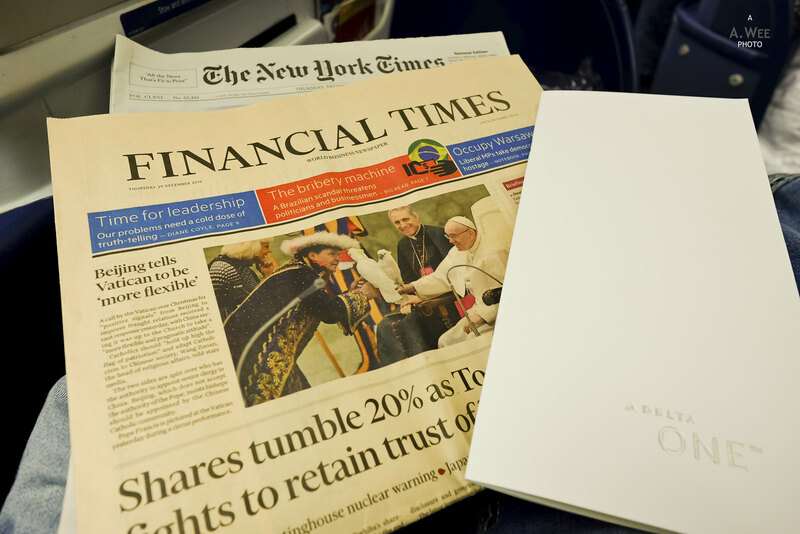 The inclusion of Westin Heavenly bedding is one of the reasons I enjoy flying with Delta Business Class for long haul flights, as they provide for much comfort. 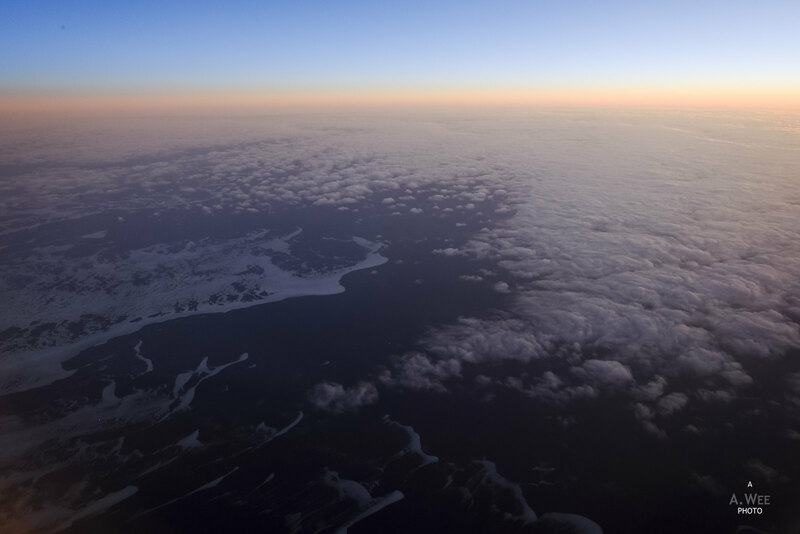 However it was still in the afternoon and I did not sleep very long, waking up somewhere after we passed Alaska. Due to the underwhelming lunch, I asked for the mid flight snack, expecting a tenderloin. What came out instead was another salmon dish and that left me puzzled. Apparently there was some mistake in the loading of the dishes or so the crew mentioned. Not sure what went wrong here but it was another disappointing catering. The consolation was the fruit bowl served on the tray with the salmon did fill me up somewhat. 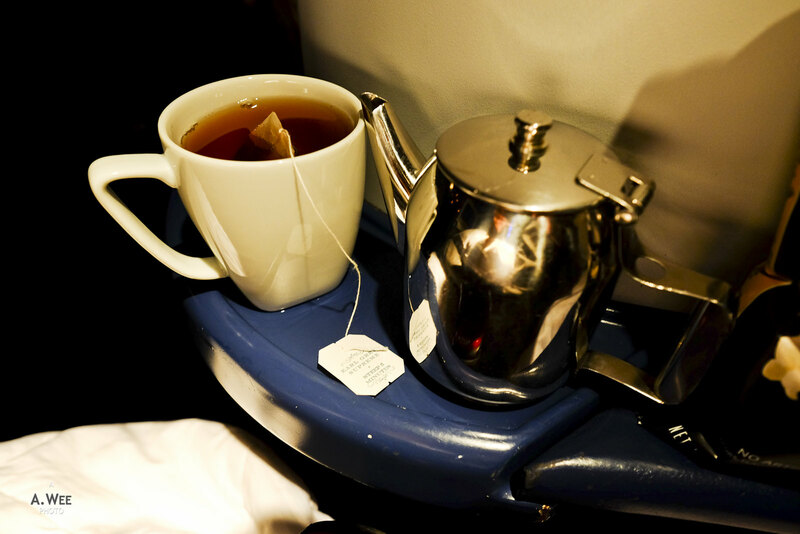 After the snack, I asked for some tea to drink as I went to continue watching the inflight entertainment. 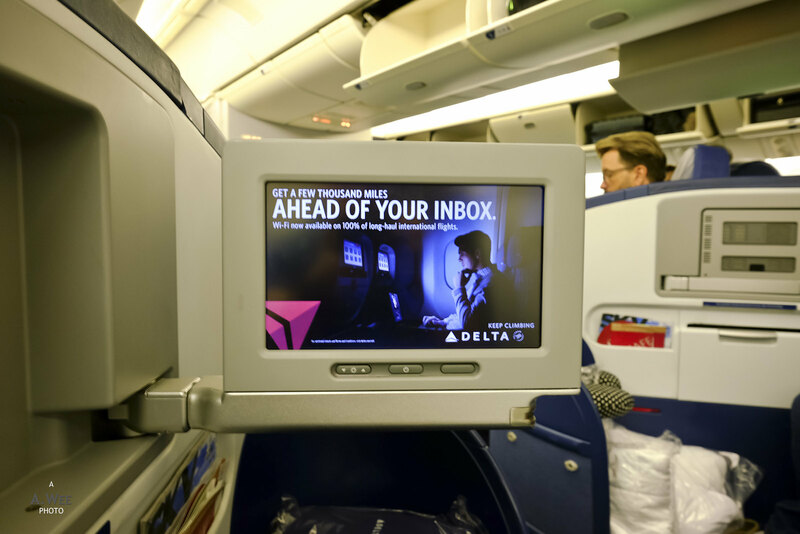 Delta has a respectable variety of movies and TV shows including some older classics. In the end I watched the TV show ‘Suits’ up till episode 4 for the latest season, The Polar Express, and a Chinese movie titled Inside or Out. In between, I did go to the galley to grab some snacks and found they had cup noodles onboard. 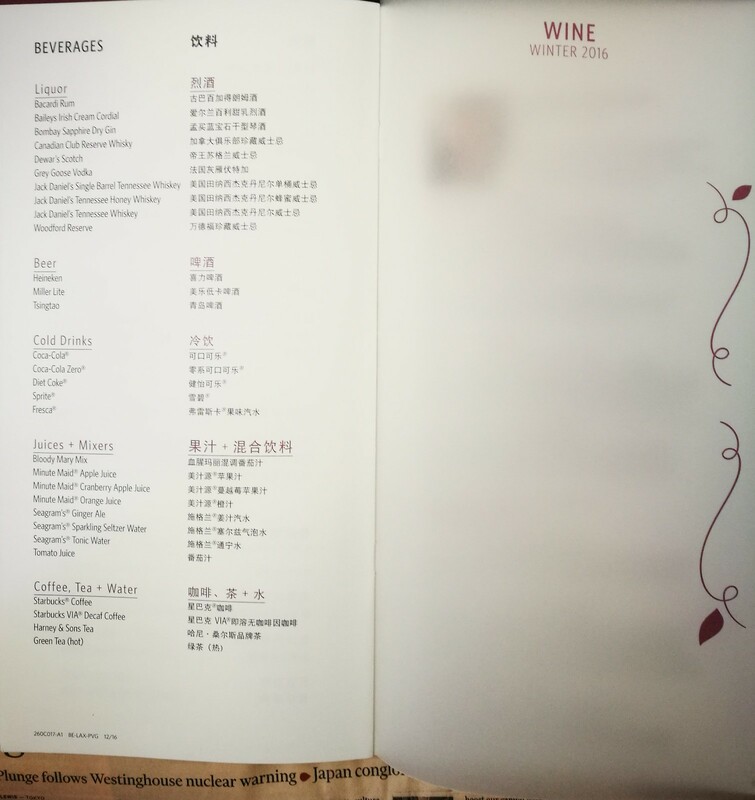 My guess it was to cater to the Asian travellers. 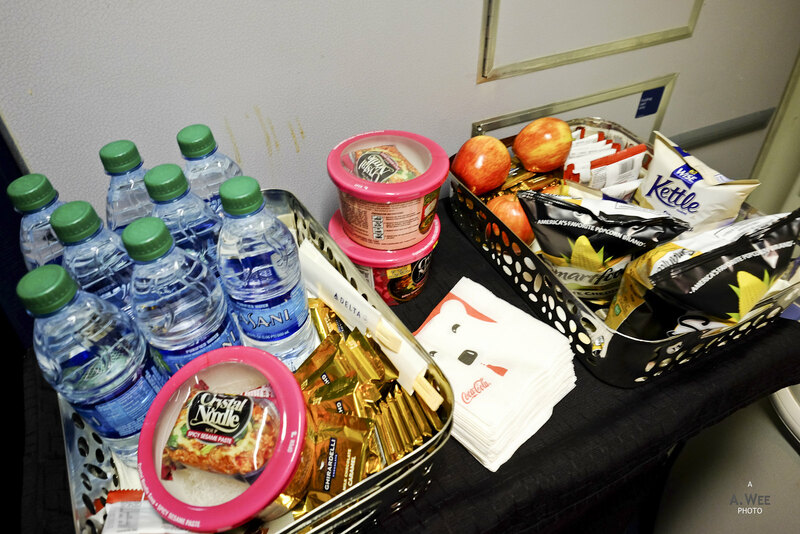 The chips selection includes a popcorn choice which I enjoyed and it was nice to have the full setup on the galley as the crew did replenish them as it runs out. 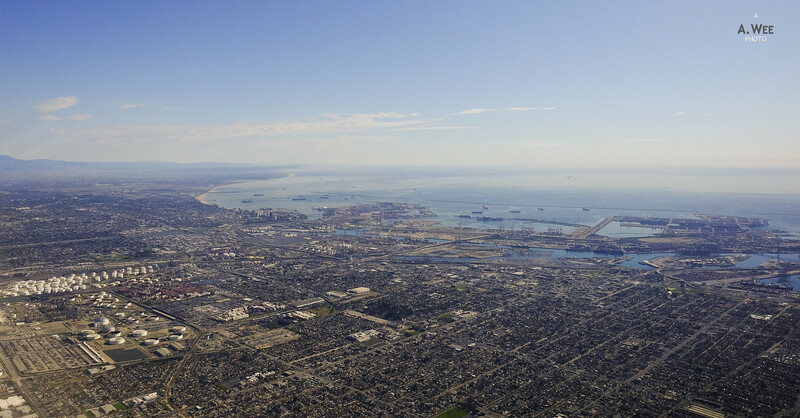 I was also glad that there was the babies onboard did not cause too much noise and trouble so it was a relatively peaceful and uneventful flight. 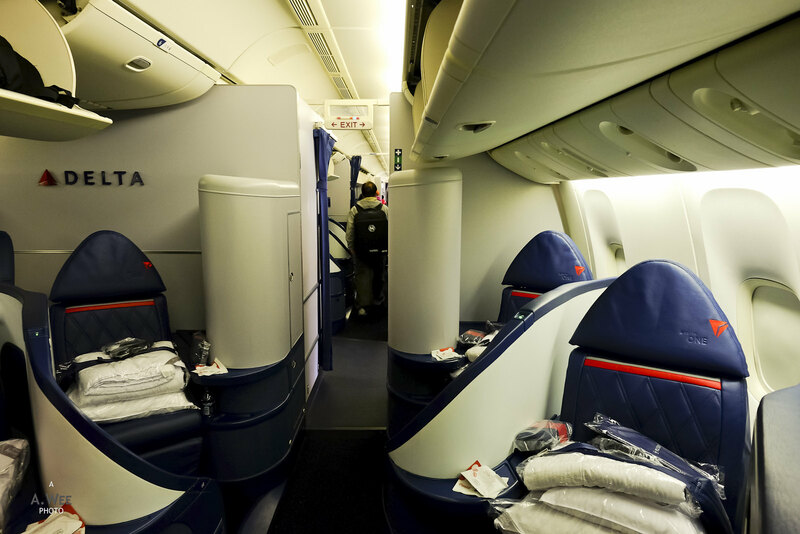 One thing to note is that these herringbone seats do not provide the most privacy since passengers and crew can see you as they pass by the aisle. 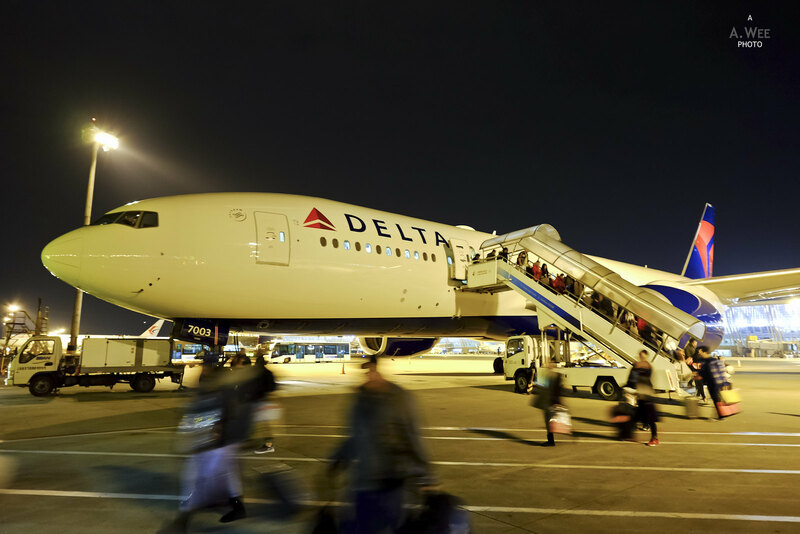 For that reason, many premium airlines have taken them out and Delta is in the process of replacing them with fully enclosed suites in Business Class as they replace the 777 with the newer A350s. What it did have was more space and legroom which makes them very comfortable for tall people. And there was a couple of them on this flight. 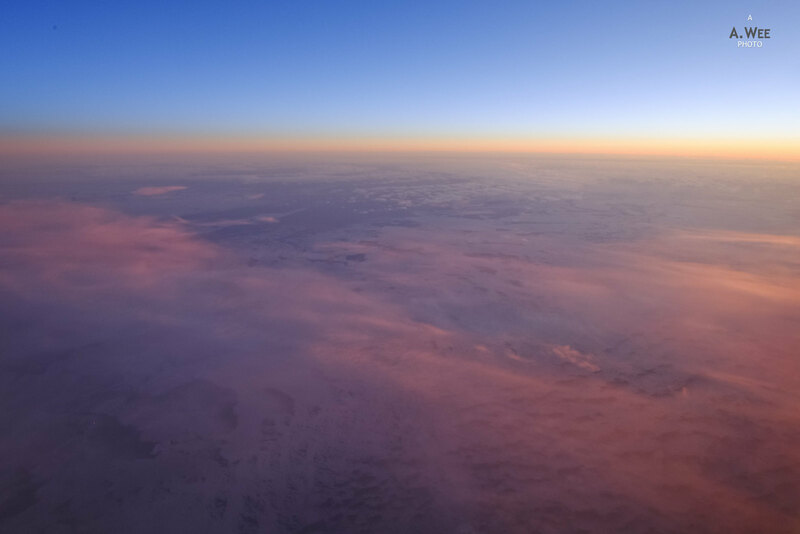 A highlight of this flight was the sunrise I got to enjoy as we crossed into Siberia and the morning light over the Tundra was just a beautiful flight. 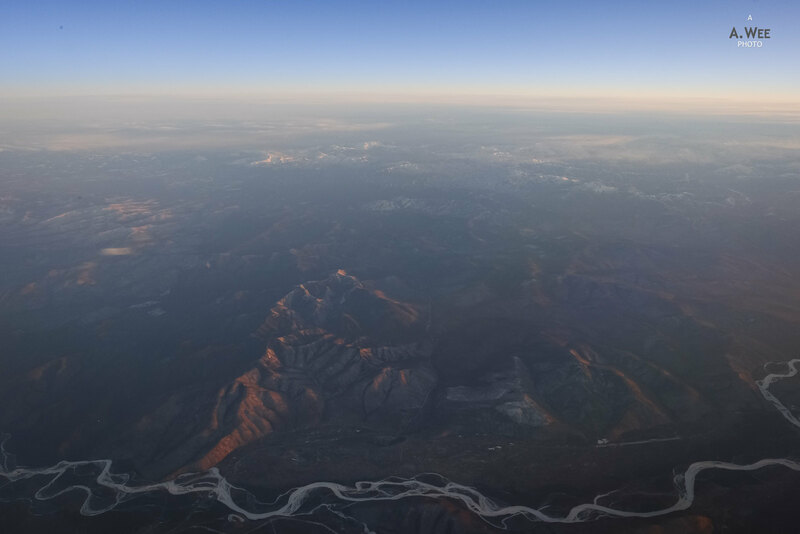 It was wonderful to see the landscape go from blue to orange to yellow and I felt fortunate to be flying in such great weather. 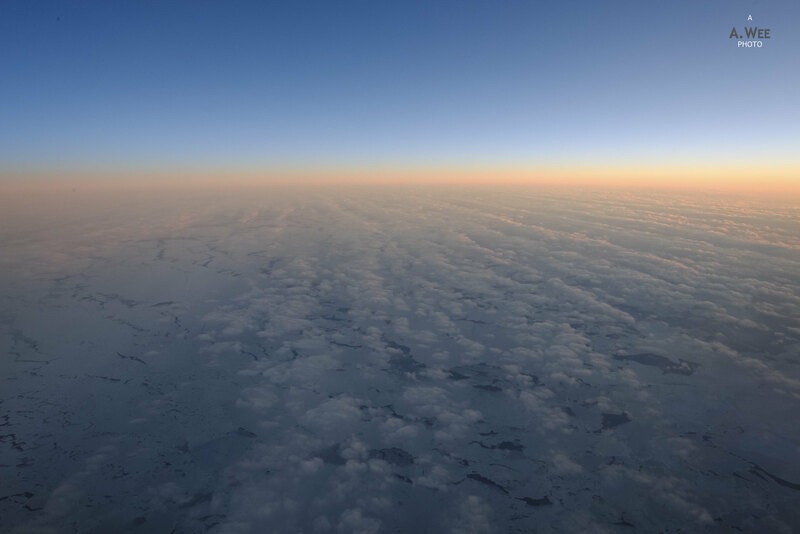 Not to mention, the frozen tundra landscape as we fly past Siberia and into Khabarovsk Krai province was fascinating to see. These landscape shots took up most of the time and distracted me away from watching the movie ‘IT’, which meant I did not complete the movie in full. And this continued all the way into the pre-arrival meal. 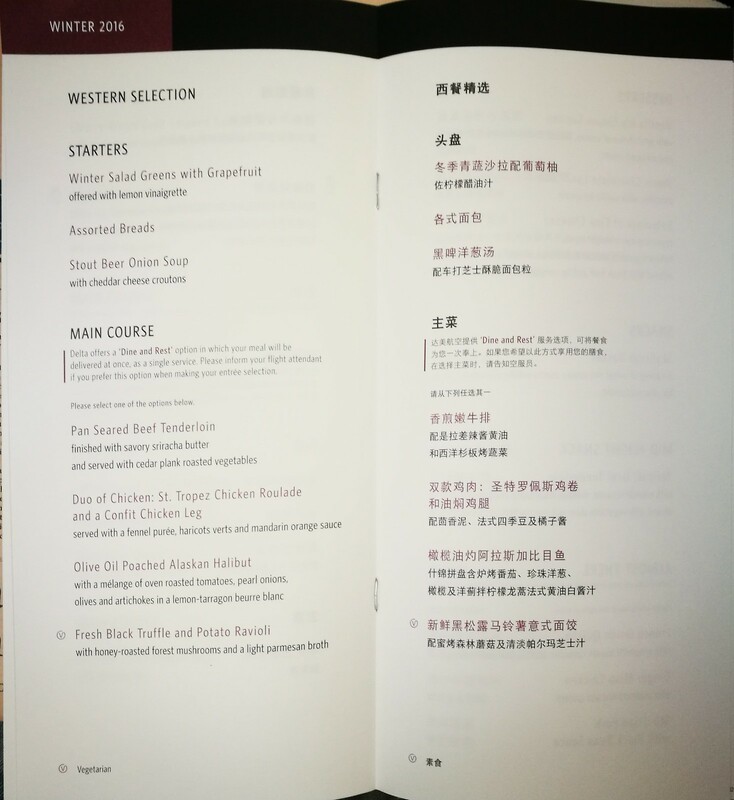 Pre-arrival meal service was offered to passengers who were awake and I went for the pork option. 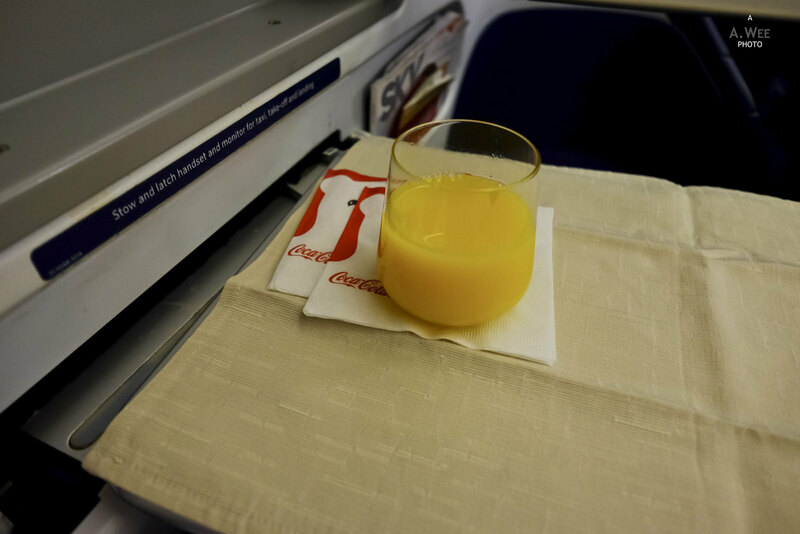 I was given my orange juice first but the main tray took a while to come out. Surprisingly it came with the chocolate lava cake that was meant for dessert. 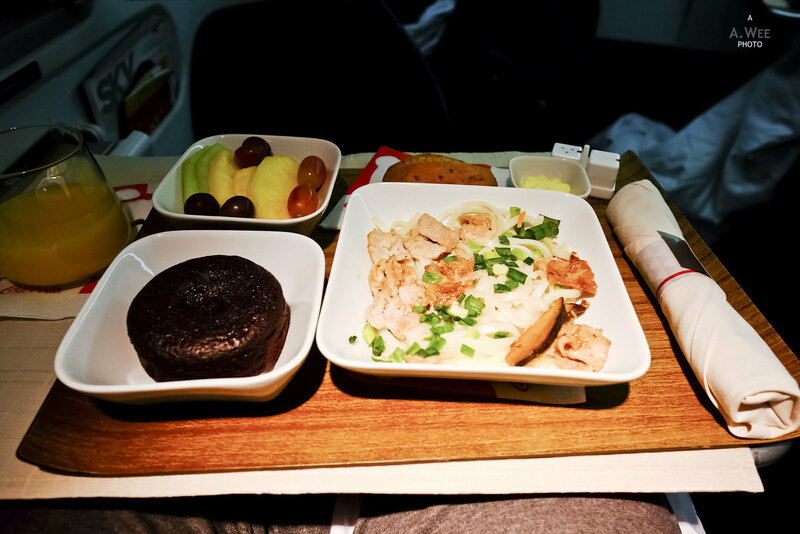 Now you see why I think the catering company messed up the food for the flight? At the end of second meal service, a basket of chocolates was brought around and it was a dark chocolate and mint piece. 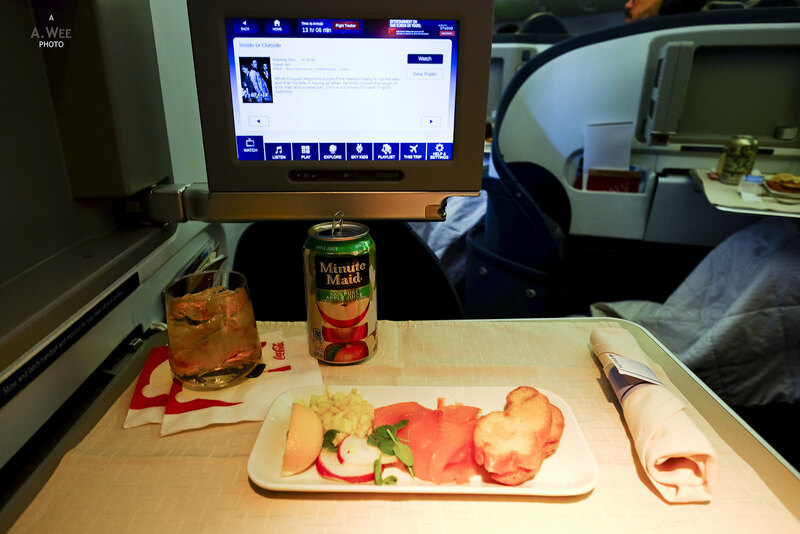 As far as snacks go, I think Delta hit the sweet spot since I have always discovered great new snacks onboard Delta flights! 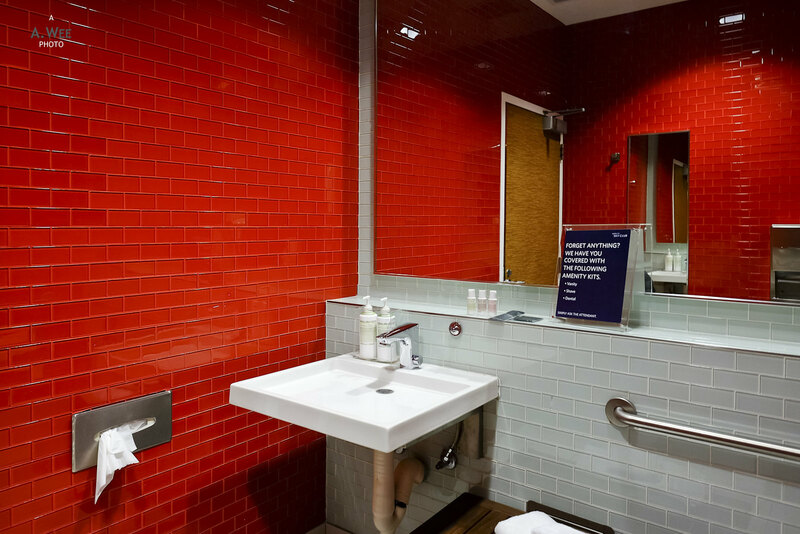 Since many passengers were still asleep after the end of the pre-arrival meal service, I did not have to wait long to use the lavatory to change back to my clothes. 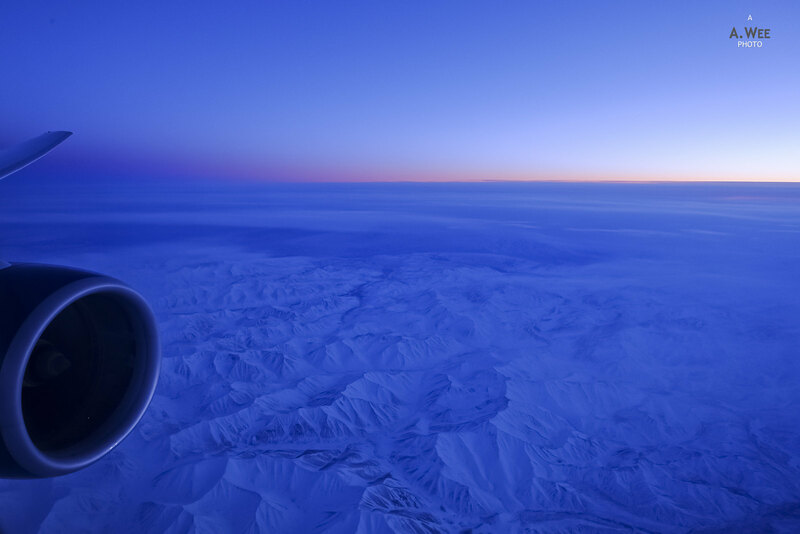 The cabin was also relatively peaceful and it was dark by the time we started our descent into Shanghai which meant there was nothing to see outside the window. While we did land earlier than scheduled, there was a long taxi from the runway to our parking spot in Pudong’s Terminal 1. On top of that, we were parked on a remote stand far away from the main terminal and that meant we had to alight from the stairs. It did give me an opportunity to catch a photo of the airplane but it must have been frustrating for the Economy class passengers as there was only one staircase and that is not something most travellers would have liked at the end of a 14 hour journey. 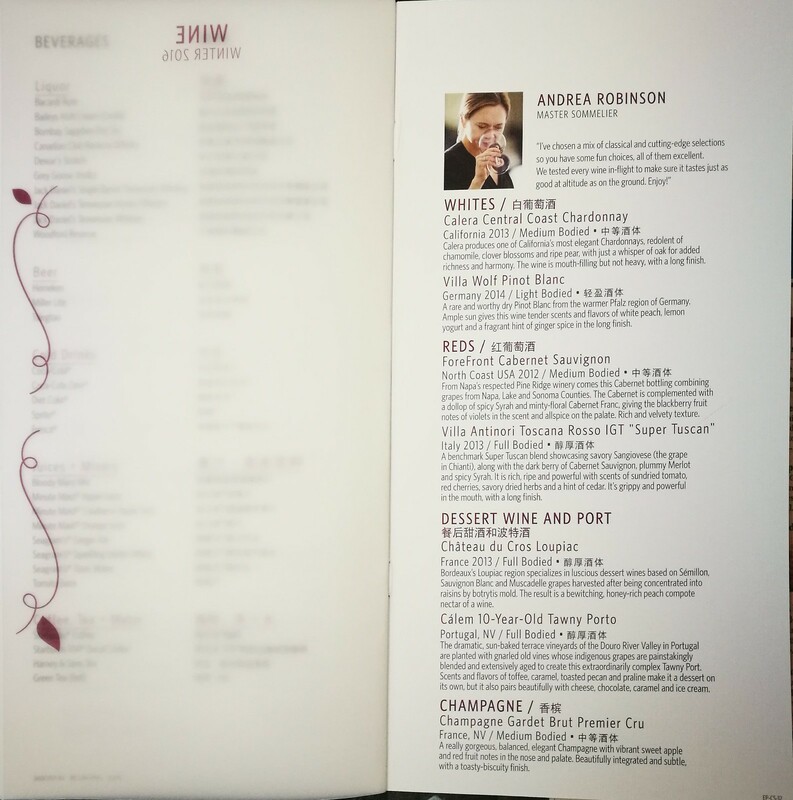 I have to say again that the messed up catering certainly made this flight memorable for the wrong reasons. The crew for this flight did their job but was not outstanding nor did they plan to interact much with the passengers. I found them to be just doing the routine thing. 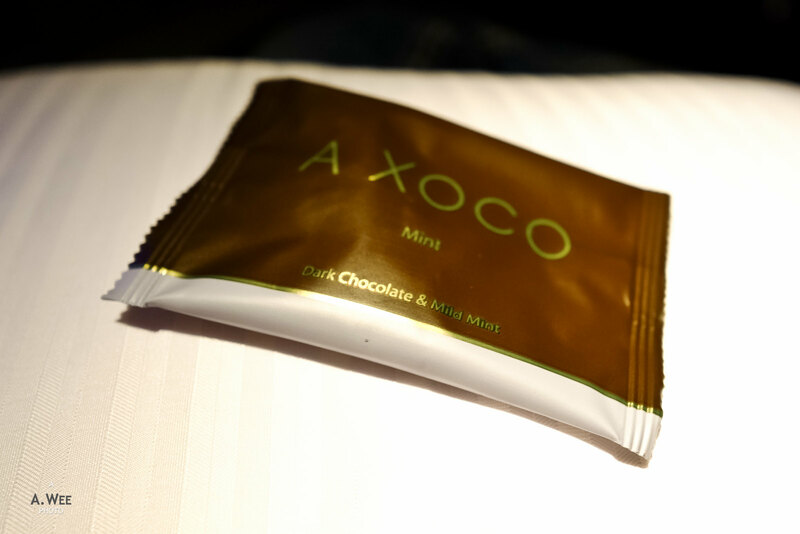 What made the flight better was the amenities provided like the comfortable duvet and the tasty snacks. 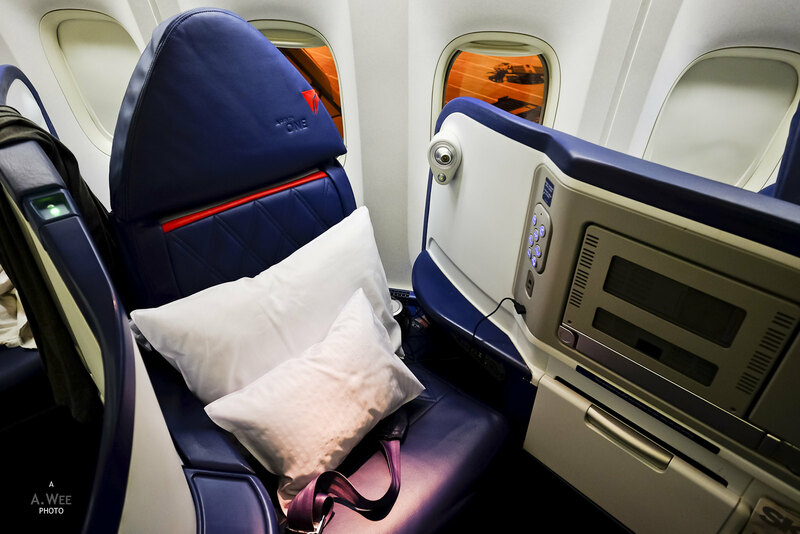 On the whole, I would consider Delta flights to be of good value for Trans-Pacific flights, especially when their fares between North America and China and quite low for Business Class travel.